Tours depart daily at 10.00, 11.00, 11.30, 12.00, 13.30, 14.00, and 16.00. Early morning or late afternoon. We are comparing Fast Track Sagrada Familia Tour Prices from leading ticket suppliers and Try to find you Cheap tickets prices on the market. Come to Barcelona and visit the highlight of Antoni Gaudi's career, Basilica de La Sagrada Familia, opened in 1882, this 19th century Roman Catholic Cathedral is the world largest cathedral to remain unfinished for over 100 years! During the summer season visiting this unique construction can involve hours of tedious queueing, so you can save yourself some time by purchasing the priority access Skip the Line entrance ticket to La Sagrada Familia and cruise right to the front of the line. This ticket also includes an educational and entertaining guided tour of the Basilica. With the help of an expert local guide you'll get up close and personal with some of Gaudi's most famous works. Marvel at vibrant stain glass windows, learn the meanings behind each and every vibrant painting, stone sculpture and intricate motif. 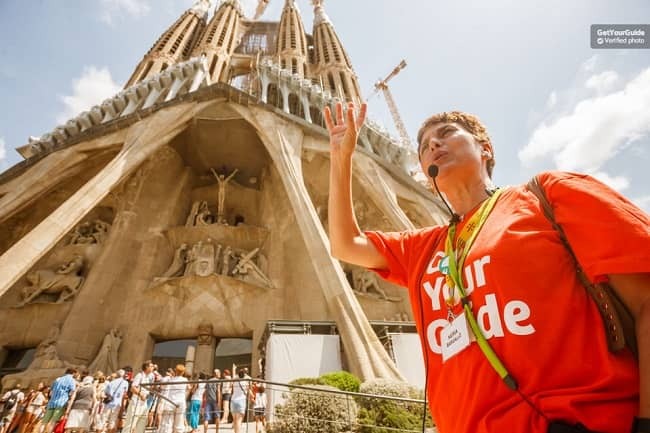 This tour is a must for anyone interested in art and history but even non-arty visitors can be intrigued by the stark differences between La Sagrada Familia and the most typical gothic-style Roman Catholic Cathedrals spread across Europe. You'll also get to visit the Basilica's Underground Museum, dedicated to the architectural planning and construction of La Sagrada Familia, as well as the personal life and prior works by Gaudi. This is a convenient and compact tour is appropriate for both adults and children, anyone with a short attention span, or anyone with walking difficulties. A guided tour of La Sagrada Familia is ideal for art and history lovers to discover one of the world's greatest architectural works. A good option if you only have a limited time in the city. Your Experience With Fast Track Sagrada Familia Tour? Pay a visit to the most famous Roman Catholic Cathedral in Spain, La Sagrada Familia, and explore the interior with an expert local guide. Learn about the cathedral and the works of Gaudi on a 75-90-minute guided tour, find out why Antoni Gaudi's legendary Basilica was never finished. Save precious sightseeing time with priority skip the line entrance tickets to La Sagrada Familia. What Fast Track Sagrada Familia Tour Includes? Fast Track Skip the Line Entrance Tickets to La Sagrada Familia. A comprehensive 70-90-minute guided tour of the Basilica. A fully qualified English speaking art historian guide. Headsets for larger groups to hear the guide clearly. Travelers Reviews about Fast Track Sagrada Familia Tour? The Fast-track tour of La Sagrada Familia has a 4.5-star rating on Viator and impressive 4.9 out of 5-star rating on Get Your Guide. The attraction itself has thousands of reviews on TripAdvisor and an average 4.5 out of 5. Travellers say not to leave Barcelona without visiting the cathedral. Many reviews talk about the informative and witty guides. Printed or electronic tickets are accepted. Cancellation policies can vary, it is recommended that cancelations are made at least 7 days in advance to ensure a full refund. Cancellations made less than 7 days in advance may be subject to a 50% charge or be non-refundable. Maximum group size if 25 participants. Please be at meeting point 15 minutes before start time. Children under 9 are free, children aged 10-17 are discounted. Tours DO NOT operate on January 1st and 6th or December 25th and 25th. Construction works are ongoing on the cathedral until 2026, at times it can be noisy. Meeting Point: Carrer Sardenya 311, Barcelona. Please check confirmation booking for detailed information.